Smooth jazz saxophonist Kenny G is playing the final note on his marriage after 20 years. Court records show Kenny Gorelick filed for divorce last Thursday in Los Angeles, citing irreconcilable differences. The 56-year-old musician married Balynda Helene Benson-Gorelick in April 1992 and they have a 14-year-old son. Gorelick, who won a Grammy Award for 1993's Forever In Love, is seeking joint custody but does not want to pay his estranged wife spousal support. Ms Benson-Gorelick filed for separation in January, but the case has not proceeded. The divorce was first reported by celebrity website TMZ. The Spice Girls and Liam Gallagher have healed their long feud, partying until dawn after the Olympic Closing Ceremony gig. 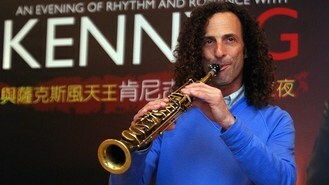 Smooth jazz saxophonist Kenny G is ending his marriage after 20 years. Gary Barlow has been praised by fellow celebrities for honouring his commitment to perform at the Olympics Closing Ceremony after his fourth child was stillborn. Pop star Gary Barlow showed what a consummate professional he was as he performed with Take That despite mourning the loss of his baby daughter. Fans never thought they would see the Spice Girls perform together again after the most successful ever girl group called it a day. Pop supremo George Michael has performed for the first time since his life-threatening battle with pneumonia. Britpop band Blur has hailed Britain's success at the 2012 London Olympic Games as they performed to tens of thousands in Hyde Park. Rihanna's sixth album, Talk That Talk, is back in the number one spot after 38 weeks in the charts.